I have unapologetically become a first world festivalgoer. The word yurt has lost what ever romance it may have once held. My lither, younger self, be-feathered and be-glittered, was content to trudge around in wellies and a cushioning cloak of psychedelics in search of bass led nirvanas amidst swelling crowds. No more. Camping has become a splendid if separate summer activity of lochside swimming and primus stove stews. These days, I’m all about festivals you can get a cab to and from. Or in the case of Helsinki’s Flow, quietly amble back to your hotel. If that can be coupled with air purity, punctuality and effervescent beauty then I’m 100% in. The often interchangeable line up’s at European festivals can add an air of anonymity to proceedings. Whilst that’s nothing to gripe about really, one of the things which sets Flow apart is that despite its compact size (only 25,000 visitors per day) it still manages to create a genuine otherworldly atmosphere through exceptionally clever programming across multiple stages, with next to no sound bleed between them. The two large tents and ubiquitous main stage with it’s tremendous AV capacity are all more than fit for purpose but what really gets our juices going are the smaller stages; indoor and outdoor. The incredibly intimate Bright Balloon Stage is a cracker, hosting jazz, world music and local luminaries in an amphitheatre setting which seats hundreds as opposed to thousands. Historically we’ve caught acts as diverse as Tuareg musicians Tinariwen and the sultry saxophone of Kamasi Washington there. This year’s highlight was an incandescent set of pulverising percussion from jazz funk legend Roy Ayers, delivered in a blaze of beautiful sunshine, which would never be bettered throughout the weekend. One of our favourites is The Other Sound stage, housed in one of Suvilahti’s existing buildings. It’s a cocoon of cutting edge, genre resistant, Avant-gardism. Like the adolescent child of the Barbican or London’s Café Oto, the programme is fiercely challenging, encompassing everything from classical to drone, spoken word to music concrete. This years programme spews forth an incendiary, darkly totemic performance by the furiously feminist, afrofuturist US artist Moor Mother. Her stark sound collages delivered silhouetted against crackling screens took us on a polemical, primeval journey. The Resident Advisor Front Yard and Backyard areas are small outdoor oasis. Think lantern festooned garden’s with people dancing amidst shipping containers, where you can become part of the dervish or recline under a tree with a Finnish long drink to watch grade A DJ’s such as Jon Hopkins, Soichi Terada, Lena Willikens and Finland’s own Lil Tony. However, probably the best thing about the curation is the consideration given to local artists, not as an afterthought but showcasing the incredible talent from this small country on the international stage it deserves. A different theme is incorporated into the festival annually. This year a commendable collaboration with the countries educational bodies created a bold visual presence on site. Aalto University partnered with Flow to showcase the diversity of student work and highlight the importance of the creative arts as a means of cultural renewal: a philosophy of huge import to the Finn’s. Communication Design students created a 100-meter mural to greet visitors at the site entrance in addition to unexpected and enchanting animations, experimental light installations and curated lounge spaces with student films being screened in the Riviera Movie Theatre. A striking addition to the already heady skyline was the architecture student’s compelling ‘Kokoon House’. An inspirationally childlike conception of a three story stackable home, the project was conceived to offer affordable housing to migrant populations. Open to the public throughout the festival, it’s an impressive feat of common sense engineering and ingenuity. The Forum Box Gallery, a local co-operative united video and animation works by Pasi Rauhala, Timo Wright and Juhana Moisander, in massive projection mappings wrapping around the site’s industrial buildings and infrastructure. However if street art is more your bag then you were in luck as ‘Make Your Mark’ a Helsinki gallery curated by two seminal graffiti artists from the 80's, had a strong presence on site. For on site food it’s pretty pricey, of that we cannot lie, so the trick is to eat well before you arrive and choose one fantastic dish daily. 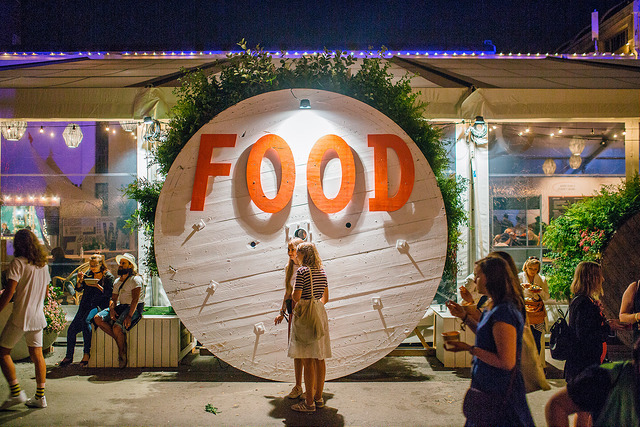 Revel in the gourmet festie fare of your dreams. The selection represents the best of Helsinki in miniature, showcasing a slew of progressive local restaurants and caterers who favour the freshest seasonal domestic ingredients. I’ve never left a festival feeling healthier than when I arrived: soaking up the inevitable booze with contemporary European and fusion food is a rare pleasure. Salivate over citrusy ceviche, fragrant ramen bowls, pomegranate jewelled middle-eastern breads and ingenious pulled oat dishes (our new favourite meat substitute). There’s also plenty of choice for flesh eaters and you can be pretty sure all the meat has been sourced organically, if not locally. Outwith the festival the cities feasting options are truly world class, incorporating high-end dining, award winning seafood restaurants and relaxed modern street food. There are myriad routes to a satisfied stomach here and great coffee too. For the adventurous epicurean, why not try a freshly sourced lunch on the island of Lonna, where we enjoyed recently foraged mushrooms and berries and drank local sparkling wine. Situated only 1.5km from the mainland and easily accessible from the city centre by boat, it feels like embarking on a high sea adventure, sailing through the mist into a miniature mystical world. Knowing that your good time isn’t coming at an unreasonable cost is a good feeling. Who hasn’t been heavy hearted at the wanton waste and post apocalyptic detritus of the last day on a festival site? The Finn’s are green ethos pioneers and present their events no differently; in addition to being quality driven and egalitarian, almost every aspect of the Flow is governed by sustainability. One of the first urban festivals to compensate its carbon footprint entirely, it has been doing so successfully for the last eight years, recompensing on emissions by investing in wind energy ventures. 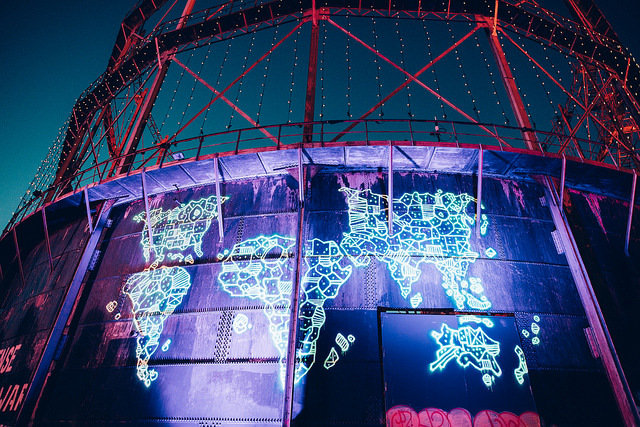 Pleasingly pertinent due to the sites location at a former power plant, all of the festival’s electricity is made with waste and residue renewables, with all site generators running on bio diesel. This extends to their model for ecological food, encouraging vendors at the festival to serve their beautifully prepared meals in biodegradable receptacles. Waste generated during the festival is 100% reused with nothing being carted away to garbage dumps. 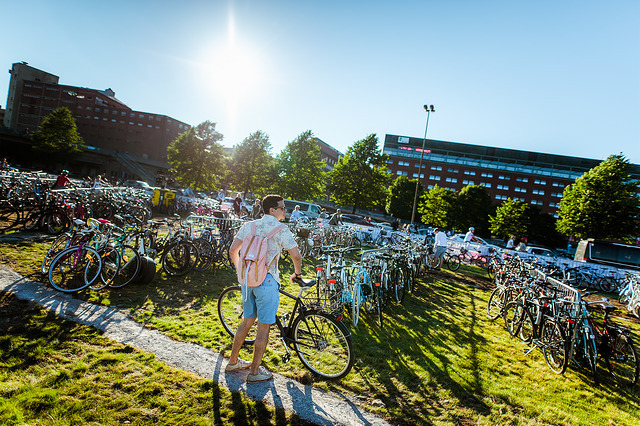 People arriving to the festival are encouraged to use public transport or bicycles (where there is a free parking area) or better still, walk the 20 minutes from the centre of town. Whilst it’s difficult to achieve this without the right infrastructure or site, it should still set a precedent for all festival organisers as the aspirational party ideal. Helsinki is a remarkable city that can be discovered entirely on foot, by metro or via charming open-air tram. Feed your soul by visiting its minimalist chapels, Lutheran churches, verdant public squares and take advantage of inner city boating opportunities. It’s a deeply reciprocal environment; any effort made returned ten fold. It’s a city in which you are consistently made to think and feel, even if what it mostly makes you feel is unhealthy. You can get to work on that easily via the cleansing medium of saunas, which are a serious business for the Finns. One of our current favourites Löyly is unique in terms of its sea front location and award winning architecture. From the building materials to the restaurant menu, it’s something of an ecological marvel. It has your ten a penny steam sauna of course but the real treat is the traditional Brother’s Grimm-esque wood-burning cabin, sitting inside of which is like being in a childhood fever dream. Expel the toxins of body and mind before jumping into the freezing sea, hands down the most invigorating way in which to expel the ghosts of any hangover. Perhaps then a stroll through the cities famous design district, dotted with gems of urban enterprise and creative co-operatives. Sleek furniture, lighting and fashion stores nestle amongst photography shops and independent galleries. You could easily blow a small nations GDP on aspirational home wares and catwalk class fashion or simply window shop and grab a coffee at one of the many street side cafes and do a bit of (beautiful) people watching. If the visual art on site hasn’t whetted your whistle, Helsinki’s public galleries surely will. The Ateneum museum is the home of Finnish art from the 19th century to the modern age. Whist there we caught an exceptional exhibition of their most famous son, architect and designer Alvar Aalto. Cleverly curated, it showcases stunning hand drawn elevations, glassware prototypes and iconic chairs in addition to featuring features striking examples of work by his friends and modernist masters Alexander Calder, Moholy-Nagy and Fernand Léger. But of course this is a progressive city where it’s less than a ten minute stroll to Kiasma, the Museum of Contemporary Art, which is currently housing ARS17, a major exhibition of international contemporary art on the theme of digital revolution. It’s an intellectually demanding five-floor walk through incorporating film, kinetic sculpture and interactive interfaces. Thrillingly, we managed to indulge in all of these activities and not miss a moment of the festival. 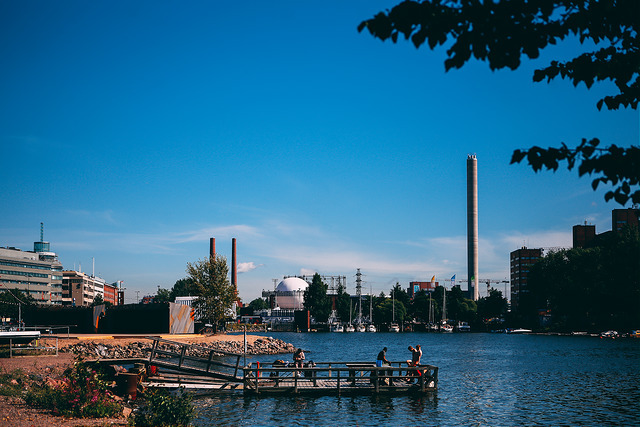 So if you’re a city breaker who loves music, an urban fashionista, a responsible vegan, a design blogger, a foodie or a culture maven with a healthy respect for things running to time, Flow Festival and Helsinki is the one. The Finn’s remind me of the Japanese in many ways: their dialogue with the natural world, respect for seasonality, effortless aesthetic elegance and their inherent shyness; but also their irreverence, admirable drinking capacity and deep love for Karaoke. So get stuck in for an hour or so before bed and sleep like a power ballad soothed baby. Allow the lands of the midnight sun to enchant each and every ones of your senses and get yourself to Helsinki next August. You’ll thank us. 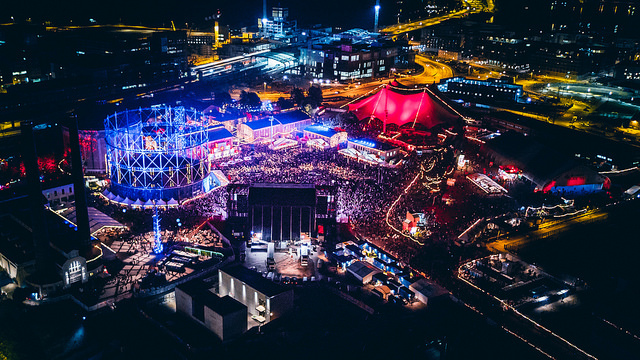 For more on Flow Festival click HERE.